Built brick by brick, many centuries-old castles in Romania were designed to withstand abuse from opposing forces and the elements. Often, being environmentally friendly was not a primary concern. 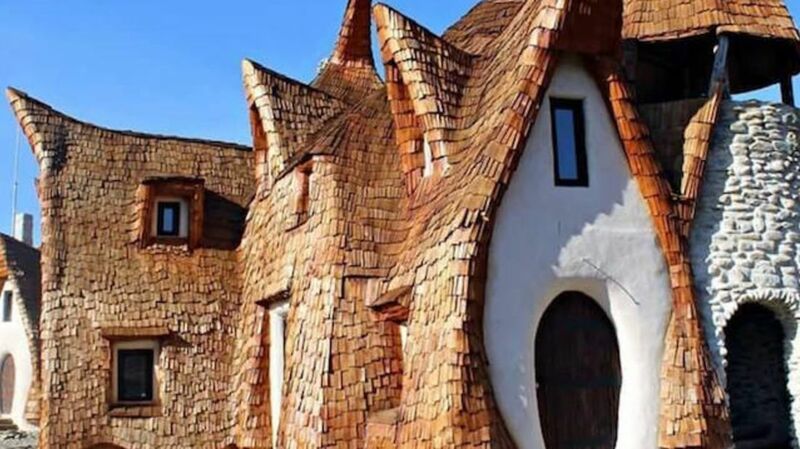 According to BBC News, one couple had a different idea of what their domicile would be, so they spent two years with an architect designing a castle out of straw, clay, wooden pillars, and sand. The 10-room unconventional castle—described as looking like "something out of the Hobbit"—was given the name "Castelul de Lut Valea Zanelor" (Clay Castle of the Valley of Fairies) by the owners Razvan and Gabriela Vasile. Located within a village 24 miles outside the city of Sibiu, the castle features views of the mountains and traditional wood-burning fires. The couple eventually plans to operate the structure as a hotel and organic restaurant. For now, you'll have to take in the structure from the outside. The castle isn't available for guests yet, but you can head over to the official Facebook page for future status updates.